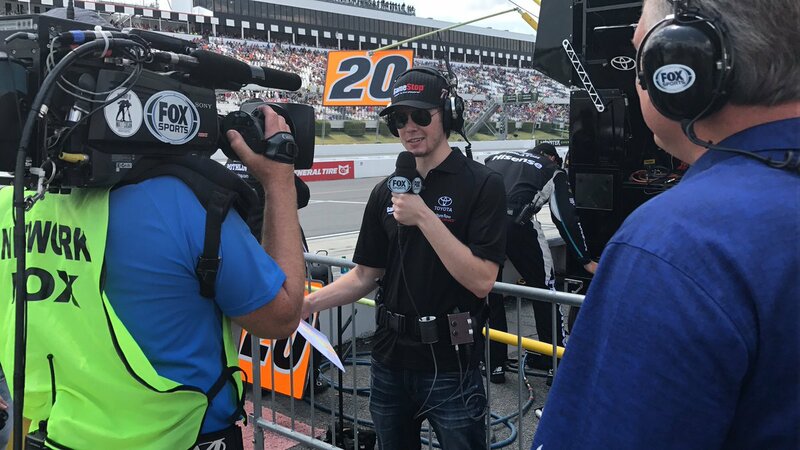 FOX and its near 200 person broadcast crew had some additional help this past weekend as they got eight current Monster Energy NASCAR Cup Series drivers to take over the broadcast for FOX’s Xfinity Series race at Pocono. 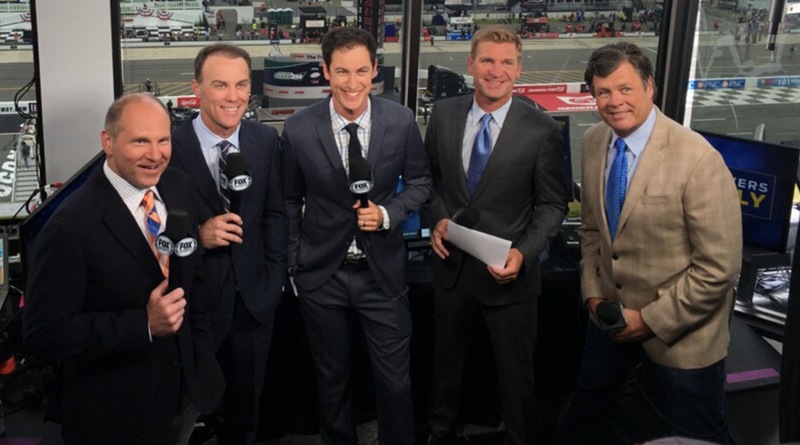 For the first time in any sport, current drivers took on the TV roles and called a race with the coaching of FOX’s current NASCAR broadcast crew. 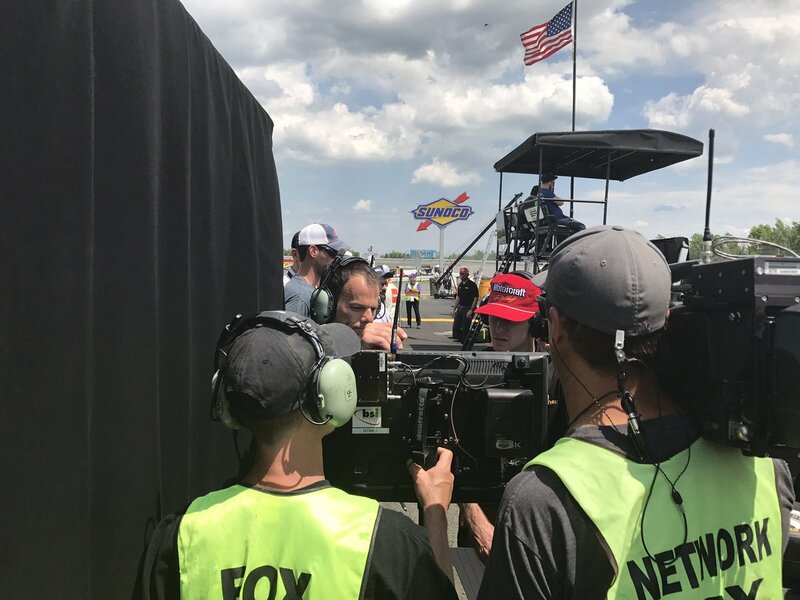 FOX was gracious enough to allow me to get a peek behind the scenes during the Pocono Green 250 and get a glimpse of the drivers in action. 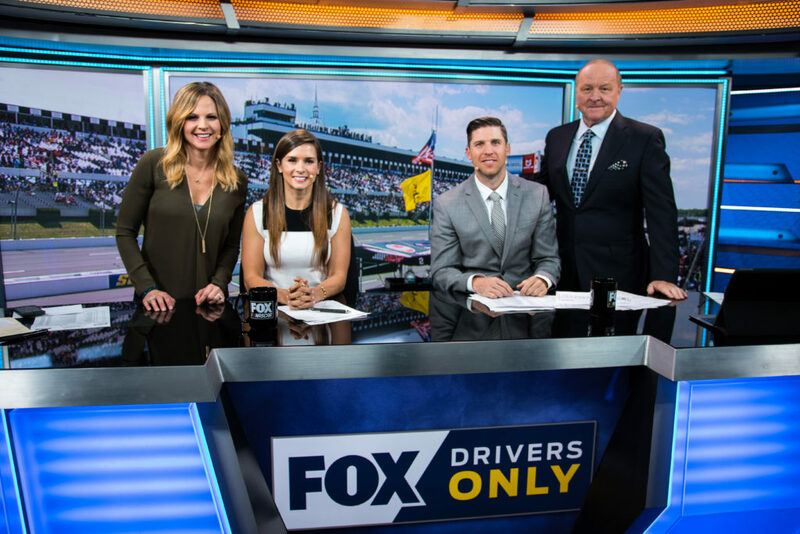 As you may have seen on the broadcast, each driver was paired with their FOX broadcaster counterpart to coach them along the way. Play-by-play commentator Kevin Harvick was with Adam Alexander while color commentators Clint Bowyer and Joey Logano were with Michael Waltrip. Those in the pits, Ryan Blaney, Ricky Stenhouse Jr. and Erik Jones were paired with Chris Neville, Jamie Little and Matt Yocum respectively. 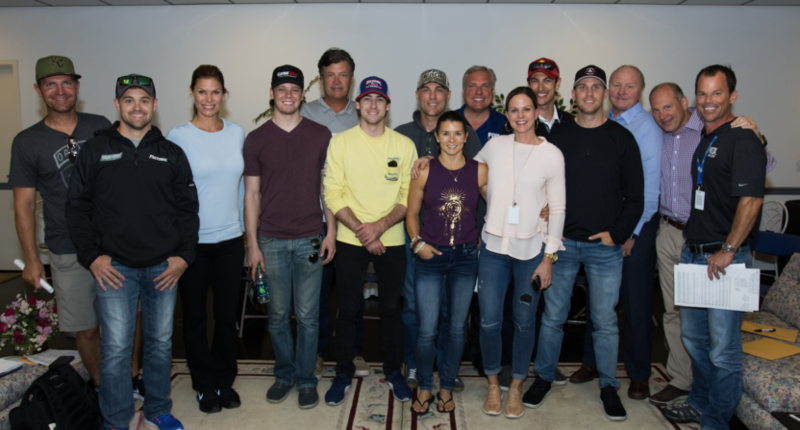 And in the Hollywood Hotel, Danica Patrick and Denny Hamlin were paired with Shannon Spake and Larry McReynolds. The drivers had been preparing for the race with the same focus they would if they were actually in the race. In addition to practicing his play-by-play on his son’s toy car races, Kevin Harvick put in some work by going to the broadcast booth the week before to get a feel for what Alexander goes through. The main thing the broadcasters wanted the drivers to know in order to make the broadcast a success was to have fun, make it their own and to give it their own personality. “My advice to those guys, because I know them all pretty good, is just be yourself. Act like you’re watching the races with your buddy and you’re telling your buddies what’s going on,” Waltrip said. While the regular FOX broadcasters were helping them out with advice and notes just off camera, the drivers were mostly on their own handling their own reports and interviews, especially on pit road which was where I spent most of the race. The only time you really heard the regular FOX crew was the few times when Shannon Spake had to read live ads from the Hollywood Hotel, which makes a lot of sense to eliminate potential conflicts of interest. With the amounts of money companies give to drivers and teams to race, I’m sure a company like Coca-Cola wouldn’t want Danica Patrick to read an ad for Pepsi if Pepsi was sponsoring the broadcast and Coca-Cola is sponsoring her. The “Hollywood Hotel” is the pit side area studio where those inside give periodic recaps during a race as well as handle the majority of the pre and postrace duties. I got to go inside and, for a production truck that’s converted into a studio, it was surprisingly roomy inside. The cameras are all unmanned so that saves on space and those at the desk can look at three big screen TVs in front of them. One has the live feed, one is separated into four blocks with various camera angles, and one has the current running order as the race is happening. If there was one positive for those in the booth and Hollywood Hotel, it’s that they had air conditioning. The pit reporters had to rough it in the heat and walk up and down their section of the pit lane to get team strategy and interviews with the crew chiefs. Ricky Stenhouse Jr. filing a live report. Erik Jones filing a live report. Ryan Blaney watching the live feed with Chris Neville. In every race, three pit reporters each take a third of the pit lane and file reports on those drivers. So that means pit reporters are responsible for compiling reports for about 13 or so drivers in a race. Blaney was down toward pit exit in Turn 1, Stenhouse was in the middle, and Jones was at pit entrance by Turn 3. While pit reporters don’t talk on TV as much as those up in the booth, they have to be on the scene immediately when something happens. 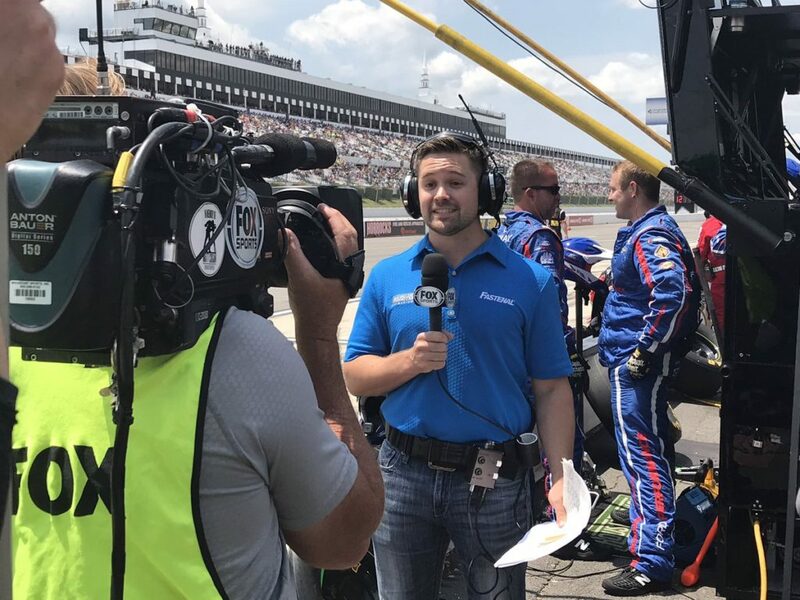 And like one instance where I had to move or else I would be bowled over by Stenhouse, Little, and their TV crew, they may have to dash to another pit when there’s an unscheduled pit stop and cover that by the time the car gets to pit road. The pit reporters also have to work together when there’s a caution so each can get their reports in by the time pit stops end. The three drivers did a great job not stepping on each other’s toes and file some great reports. When this concept was first announced, I knew it would be different, but I thought what many others had thought: that this would either be the greatest thing or a complete disaster. After watching when I got back from Pocono, like many others, I loved the broadcast. There might have been the occasional moment of dead air or an awkward transition and the finish kind of gotten bungled, but each and every one of those drivers exceeded my expectations and I would have thought every one of them have been calling races for years. I likened this experiment to the drivers undergoing a TV media internship and this was the final exam. They got training doing previous races, got advice from the experts, and now they have to show what they learned. And they passed with flying colors. Drivers appreciated the ability to watch a race from a different point of view and gain a new respect among those in the media. But the important thing was everyone took the advice they were told at the beginning and that was to have fun. I wouldn’t want to see a Drivers Only broadcast happen all the time because the concept could easily be watered down when done too often. But maybe once a year, at a place like Pocono where things could be drawn out at times, FOX could bring out a Drivers Only broadcast for a Saturday morning and give the viewer something unique and different. FOX came up with a brilliant idea and could really have something when it comes to the future of broadcasting. I’m looking forward to see if anything comes out of this.